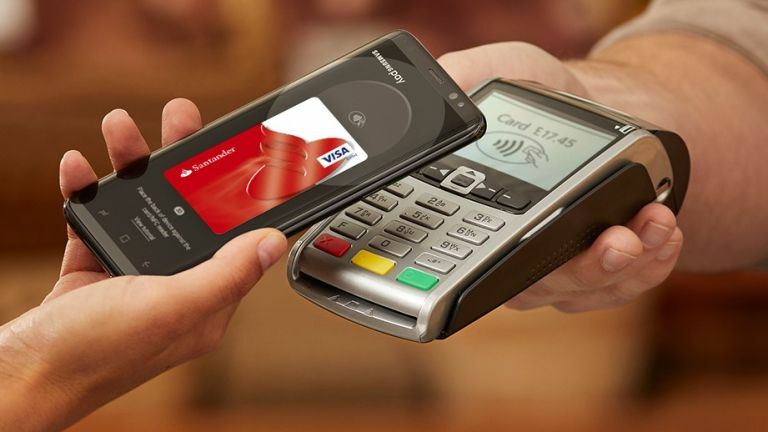 Although the US has had it for a while and it's way behind Android Pay and Apple Pay, Samsung has finally announced Samsung Pay for the UK - providing you're using a Visa or Mastercard issued through Santander, Nationwide or MBNA. We've also heard it will be available soon on the Galaxy A3 (2017), Galaxy A5 (2016 and 2017) and Samsung Gear S3. To pay, simply swipe up on the phone’s screen to select your Visa card of choice and confirm the payment via fingerprint, iris scan or passcode. Note that you need to have some kind of device security enabled of some sort. Samsung has worked with Transport for London on a feature that means you don't need to unlock your device before tapping it on the reader. Clever stuff. With the Gear S3 the payment can be started with a touch of a button. The Samsung Pay app is pre-installed on most Galaxy handsets, but you can download it of course. You add your existing credit or debit card and you'll be asked to verify it by your provider. Naturally, it's also secure like other contactless payment methods - your card details are not provided to the merchant, instead your number is substituted with a unique token specific to your card and device. If the phone is stolen, it can easily be deactivated and you won't need to cancel your card.